This is a story about the big guy vs. the little guy, and it’s a story about how the little guy wins. Not because he’s stronger, or has more money, or because he knows more people,… but because he’s smarter. It’s a story that I love because it’s our story. It’s also the story of the Agenda Tradeshow. A streetwear/skate tradeshow is like this: Brands from all over the world gather in one place to showcase their collections for future seasons and stores attend to make their orders for the year. Aaron Levant started this show when he was just a kid in his early 20s, it was a response to the more established, big, corporate shows out there like ASR and MAGIC. The first tradeshow we ever exhibited in was Agenda, back when Aaron used to host it in downtown LA. It was just about 20 brands or so, I think just a handful of those brands still exist today. Over the years, Agenda blossomed, growing in size, but more importantly, respect and reputation. It’s not easy to put on a good tradeshow. You have to be aware of keeping all these brands (who consider themselves the best, and deserving as much) happy. You have to find a venue to work with, money to back it, and you have to win over the favor of exhibitors and buyers alike… That’s not even something you can buy, you have to put in your dues and earn it. Agenda did it. And I think much of their success can be attributed to working with the right brands in their roster. Not the largest brands, or best-selling, most popular, or attractive. Just the brands that hold some type of legitimacy in our world and the ones who are consistently offering good product. The problem we’ve had over the years with the big shows is that in the end, they really couldn’t care less about us, the little guy. They have more “important” clients to deal with, mega-corporations hiding behind a guise of hip apparel, who can offer all kinds of financial returns for convenient booth placement. In bigger tradeshows’ eyes, we don’t have much to offer, both money and image-wise. …And that’s where they go wrong. Aaron understands to build and maintain a successful tradeshow, you don’t need to work with the biggest, famous, richest brands.. you need to work with the RIGHT brands. I ran into Mike T from Obey today and we both agreed that what makes Agenda work is that it’s still so raw and level… literally, figuratively, on our level. And in that way, Agenda stays relevant. If you’ve been reading between the lines, this isn’t just about Agenda and tradeshow politics. It’s about how crucial it is to heed the little guy, respect him, and take care of him. Because one day, that guy’ll grow up to be the BIG guy, and he’ll remember exactly how you kept score. The Agenda show was held over the weekend in Huntington Beach. Here’s Revok laying the lettering for the entrance mural. 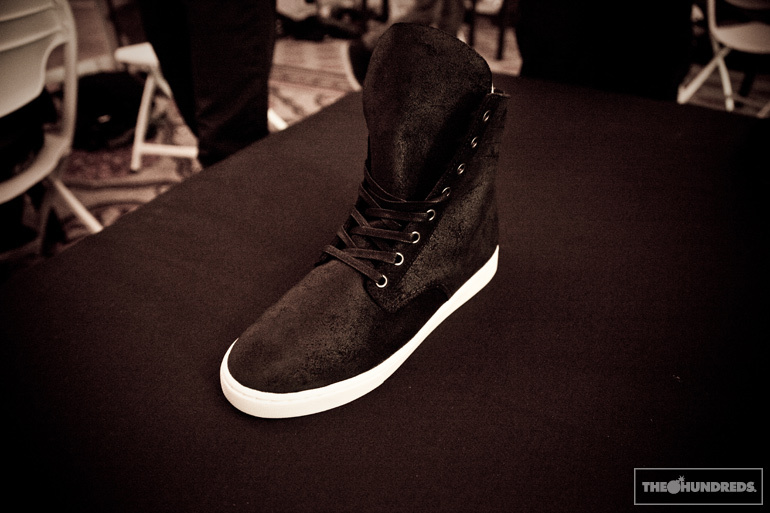 There’s always 1 brand that gets people talking at every show. For me, this time, that brand was Freshjive. The new no-label range from Klotz and co. is fashion-forward, wearable, and still maintains that pushy flare (Be forewarned before you click on that link! NSFW.. actually Not Safe for The Faint of Heart). 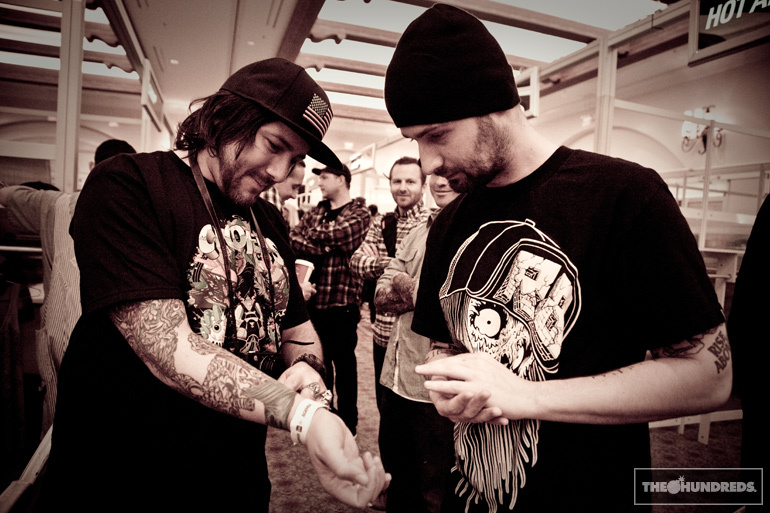 Greg Mishka and Joshy from Rebel 8 compare inkwork. 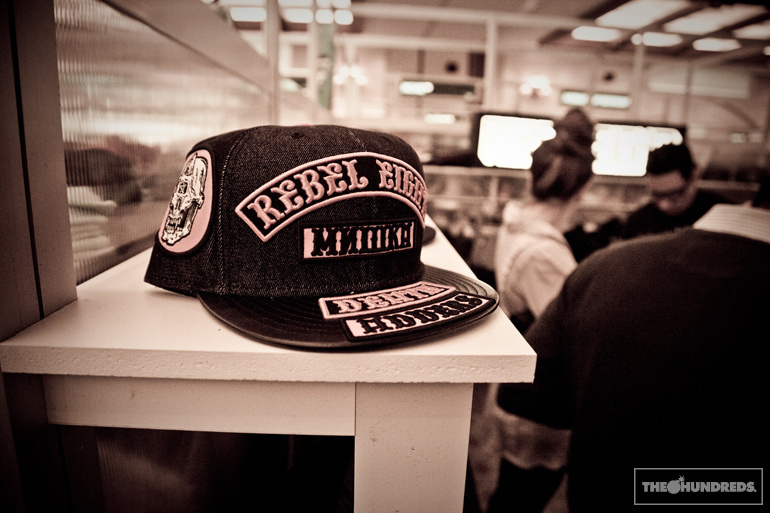 … and they got together on this biker-inspired fitted as well. By far, the best New Era I saw at the show. Erica is over at Podium now. 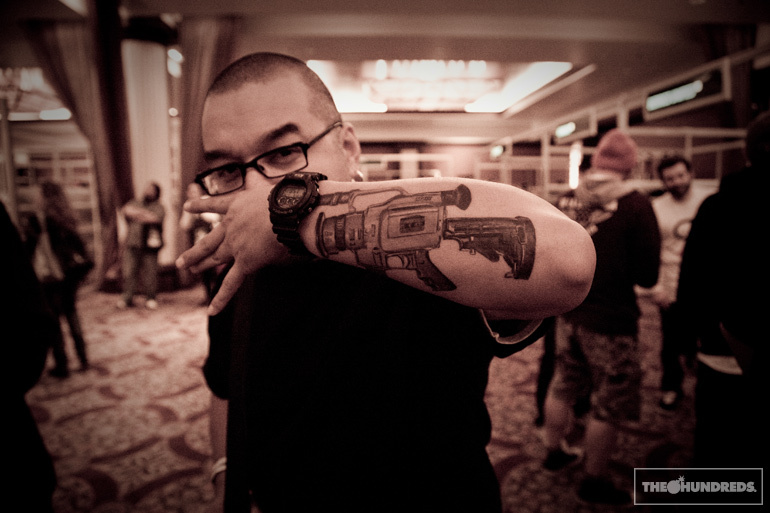 DVS/Matix represent! I ran into P-Rod in the hallway. It was hard to get a conversation out of him with so many people wanting to say Hi. And there’s Paul in front of his P-Rod booth, surrounded by other skate luminaries you may recognize. This year, Agenda introduced The Berrics / Agenda tradeshow, a downstairs component to which was probably one of the best put-together skateboarding shows on its own. The supplement added life and character to the already bustling Agenda. 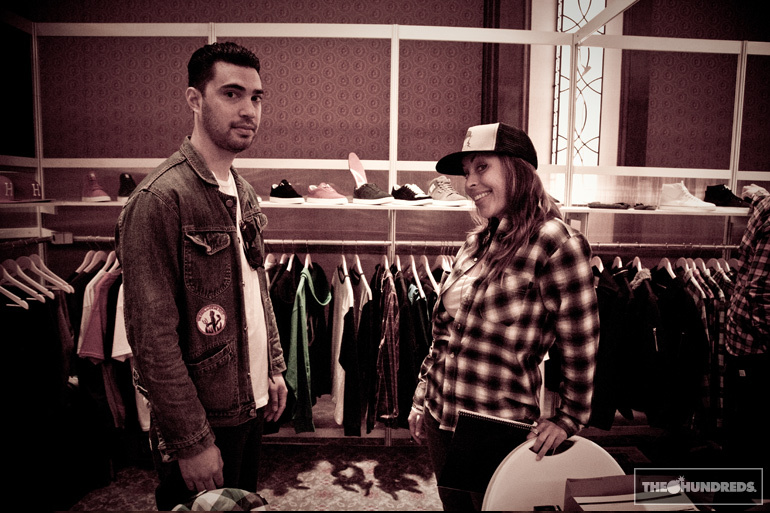 Hanni and Anne at HUF, who also showed in The Berrics / Agenda. As far as skate apparel goes, Huf takes the cake, especially with Keith’s new footwear program. My favorite brand of the show though? Gotta be Skate Mental! 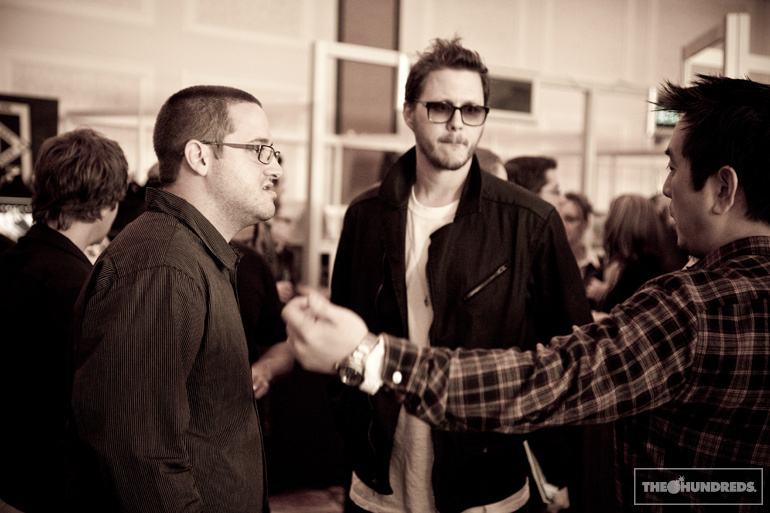 Joy (Krew/Supra) and Joe (Linkin Park / Suru). And there’s Joe talking to the man himself. 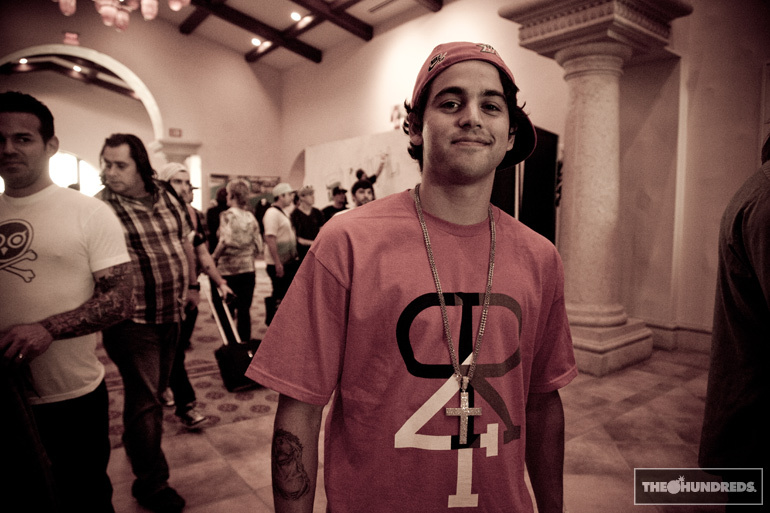 Aaron Levant (Agenda) on the left, with Ashley (Krew/Supra). Hungry? Ben and I headed around the corner to TK Burger. Like Agenda, this hamburger joint just gets better and better. TK Burger = the Agenda of burger stands.